Sign up for Broadjam today to follow Alias Isaiah, and be notified when they upload new stuff or update their news! During the day, Alias Isaiah is a mild mannered teacher. In the evenings, however, Alias Isaiah is a Texas musician who recently released his debut album, "Who Is". For his album, he was able to record most of his own tracks, including piano, guitar, vocal, and clarinet tracks, excluding only the drum set track. His music, after just recently debuting, has already found its way into hundreds of fans ears worldwide! Currently, Alias Isaiah is promoting his album and has begun work on his second album with a planned release in summer of next year! Following Alias Isaiah on Instagram, Twitter, Facebook, YouTube and many other social media platforms is as easy as typing his name into Google and searching. You can also go to www.aliasisaiah.com to find links to videos and pictures and discover Alias Isaiah on his next night out! -Alias Isaiah will be playing at the Curtain Club in Dallas, TX on May 31st! Send him an email to get your tickets for $2 off the door price! 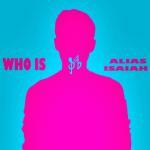 -Alias Isaiah's new album,"Who Is" is now available everywhere music is sold!